I deleted the last blog haha. I realized those Brooke brows were so unbecoming. So I re-did the brows, fixed the hair. I'm no artist and wish my mother allowed me to take that Fine Arts course in College (she believed that artists don't make much). Well after me, I now have 3 sisters who are into the arts -- lucky them. An Interior Designer, an Industrial Design artist who also illustrates for children's books, and a photography-digital artist who now resides in Seattle. Okay, so let's go to repainting. There's one word I have for it -- frustrating. And if you're interested to get into it there's also one word that I have for you that is so important to the craft -- Patience. If you can stretch it, stretch it as far as you can. I'm not good at it. Guess I always wanted immediate gratification. And so, it is also a great lesson in delaying gratification. The title says Things You Ought to Know about Repainting. Patience is a given, so I'm not including it in the list. Check out www.jerrysartarama.com, and www.misterart.com and you'll see what I mean. 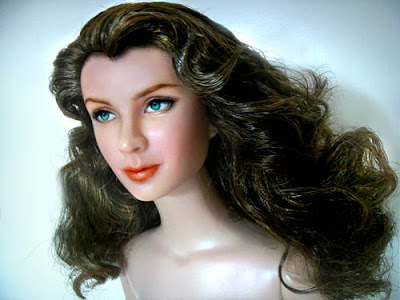 For references on repainting you can also check www.uydolls.com -- this one was helpful for me. The artist is very generous with details. It is rare for you to find that kind as technique is also a secret to their business. But you know what, it's how you handle it really. 2.Study color mixing. I had to get this book "Color Mixing Recipes for Portraits - Featuring Oil and Acrylic -- Plus a special section for Watercolor." It has more than 400 combinations for skin, lips and hair. I did not study this thoroughly but use it as a reference, specially for those "oh so difficult eyes". If you're into portraits, I'm sure this will be a good enhancement to your craft. 3.It's all about "diluting" the acrylic and glazing. You have no idea how much it takes to just make a soft-looking brow or lip. So practice on that. I still am if only to get the results you want -- a realistic, soft look. And put your palette on ice, so it lessens the time for it to harden. 4.Get the "Thinning Medium". That will help you in creating the glaze for the contouring and shading. 5.Look at Makeup magazine, Vogue or Allure to see the latest in color if you wish to get into creating Supermodels. Myself I prefer "beautiful" dolls than those that are too heavily made up. Also study "contouring" the face. The skintone of the doll is not realistic sometimes, so you'll have to do a lot of contouring all over to create a "pinkinsh" or "tan" tone. 6. Study the eye. There are parts there that are so minute that you have to know which goes first. The "little tear ducts", the "gray color" that you shade around so to create a shadow, the roundness of the pupil and iris : those are layers of paint. 7. The "little push" technique or "dry brush technique" (not sure if that's what it's called) whereby you "dab" a particular area to create a soft diffused look -- I usually do that in the eye. 9.I always use a lead pencil to outline the face but make sure it is very light. There are pencils that are light so I'm sure you'll be able to find that easily in any art store. 10. Over and beyond the technique and what you know, it's all about how you handle your time with the repaint process. Your patience will be tested. And I mean test with a capital "T". So if you're not like me then, I'm sure you'll be able to sell some of your dolls on ebay and enjoy the art. Great tips--and I have to say, I'm impressed (though I can't tell photoshopped photos one from another). I stick to sewing, myself--and sewing large, flat items, like quilts, which don't require fitting. ;) Love your blog--and keep up the painting. 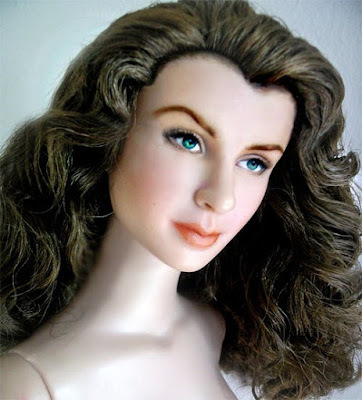 I can't wait to see what you do with a blank canvas like the new Antoinette doll. I think you'd have a blast! Thank you Alison! I hope they shed some enlightenment on this patience-driven craft. Perhaps all types of crafts involve patience. Quilting? Interesting! Tell me where I can see some of your items! I remember the film: The making of an American Quilt. Quilts can have stories too it seems. And beyond the bed, they can be curtains, dresses, shawls little hankies. Yes, the Antoinette doll is beautiful! I am thinking about her actually. Drop by again soon Alison! Happy Easter to you and your loved ones!